The Supply Chain & Logistics Institute is located in the Groseclose Building within the Stewart School of Industrial & Systems Engineering Building Complex on the West Campus of Georgia Tech and across the street from the Student Health Center and Campus Recreation Center. Take Exit #249D (North Avenue). At the top of the exit ramp, turn right onto North Avenue. Cross Techwood Drive (the first light) and continue on North Avenue to Cherry Street (before the next light, Tech Parkway). Take a right on Cherry Street. When Cherry Street ends, take a left onto Ferst Drive. Follow Ferst and pass the Student Center on your right. Continue to look to the right for a visitor parking sign (Parking Area 3 - see below) that references the lot next to the ISyE Main Entrance Building. If you pass the Campus Recreation Center on your left, you have gone too far. Take Exit #249D (Spring Street/West Peachtree). At the top of the exit ramp, proceed through the first intersection (Spring Street). At the next intersection (West Peachtree), turn left. Continue on West Peachtree for approximately one block and turn left on North Avenue. Cross over the interstate and Techwood Drive. Continue on North Avenue to Cherry Street (before the next light, Tech Parkway) and make a right. When Cherry Street ends, take a left onto Ferst Drive. Follow Ferst and pass the Student Center on your right. Continue to look to the right for a visitor parking sign (Parking Area 3 - see below) that references the lot next to the ISyE Main Entrance Building. If you pass the Campus Recreation Center on your left, you have gone too far. Upon entering the preferred parking lot (Parking Area 3), you will be provided with a time-stamped parking ticket. If "Lot Full" sign is posted at this lot, please proceed to the Student Center Deck. If the Student Center Deck is also full, you have the option of finding a metered space in the immediate vicinity (there are 5 metered spots on Ferst Drive across from the Campus Recreation Center – 2 hour limit, 15 minutes = .25, 6 minutes = .10, 3 minutes = .05 ‐‐ bring change) or proceeding to the further State Street deck. From Parking Area 3, you can see the ISyE Main Entrance Building. Enter the building and look to the right for the receptionist's desk to ask for further directions to our suite. The MARTA north line trains take you from the Atlanta Airport baggage claim to the Midtown (N4) station. It is a $2.50 fare and takes approximately 20-minutes. The Tech Trolley is free of charge and runs from the Marta station to the ISyE complex (exit at the Campus Recreation Center stop and walk across the street). Check the Tech Trolley schedule for the weekday and weekend schedules. The Tech Trolley runs every 6 minutes during peak hours and is free - map of trolley route), If you are staying at the GT Hotel and need to come to our offices for a meeting or course, please follow the below directions to take the Tech Trolley to the SCL Suite/ISyE Complex. Enter the left building (Groseclose) and take the corridor towards the left. The SCL suite will be on your left before you reach a bridge to a separate building. 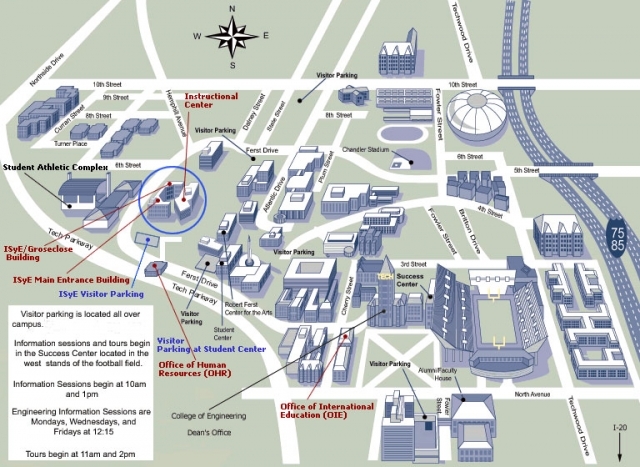 The SCL suite is located in building 56 (Groseclose) which is to the left of the ISyE Main Building. When exiting the Tech Trolley, turn left and walk down the sidewalk, looking to your right for signage for the Frank Groseclose Building. After you enter the front door of the Groseclose Building, go left down a long hall and look for our suite door on your left. If you reach a bridge to another building, you have gone too far.